Quality School Research Papers discuss what characteristics the teachers, and lesson plans need in this environment. In the Quality School, the teacher must make certain that the content and teaching methods in which teaching the curriculum set meets the basic needs of the student in shaping how and what they are taught. Active and cooperative learning techniques are used to encompass the total learning potential of the students. In fulfilling the needs of the student, loyalty is established and learning becomes a group project. Belonging, acceptance, belonging to a group or the class. Power, which is gained by producing competent work. Freedom of self-reliance, with minimal direction and with the feeling of control. To implement these needs, Glasser suggests moving from the traditional structure of individuality and creating teams of approximately four students each. Teams bring a sense of belonging, pride for the group motivates, stronger students help the weaker students, weaker students feel a contribution to the group, and the collective effort of the group gives a sense of freedom from the teacher. The person with a success identity has a belief that life is worth living, that they amount to something, that things are worth doing because they have a reasonable chance of succeeding. They are autonomous learners. They generally possess high self-esteem. 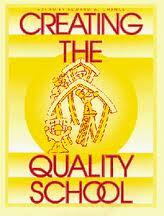 In a Quality School, information is not merely memorized but it is implemented into teaching a skill. A skill is a useful tool that has meaning and purpose in daily and overall life. Memorization is never done in the quality school and information is discussed and related rather than rehearsed and reiterated. However, to satisfy requirements such as college entrance tests and state sponsored skill level tests, information should be discussed honestly and openly between the teacher and student. The recognition of this need to learn what does not directly apply to the student assists in opening the door to expanding knowledge boundaries and critical thinking for future advancement. Therefore, the student is able to see how non-applicable information is necessary to gain degrees and status for the future. "This book will explain how Dr. Deming's ideas can be brought undistorted into our schools so that the present elitist system, in which just a few students are involved in high quality work, will be replaced by a system in which almost all students have this experience". Cooperative Learning Kagan research papers discuss the theory known as “ cooperative learning,” a new strategy that would employ the use of group learning. Campbell Interest and Skill Survey - The test to critique is the CISS (Campbell Interest and Skill Survey) where quality of writing in test materials are discussed. Paper Masters writes custom research papers on Quality School and discuss what characteristics the teachers, and lesson plans need in this environment.